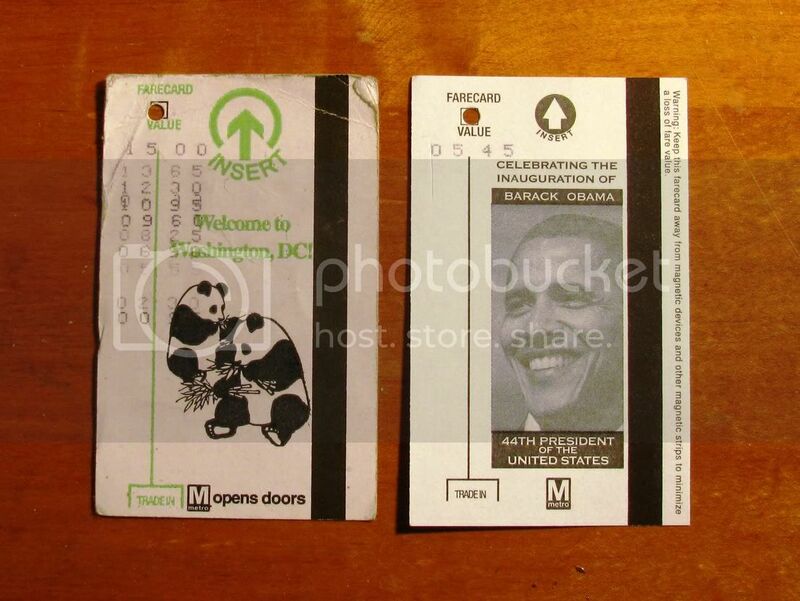 Left: the Washington Metro card design that had been used for years and years, from a fare card I still had in my wallet from when we left DC in the summer of 2006. Right: the card being sold by Metro ticket machines now. Surprising similarity between Beijing and Washington, which I had a chance to reflect on while gritting my teeth in long lines in front of the ticket machines yesterday: in neither capital do out of towners have a clue about how to buy tickets from the machine.This was a big nuisance for Beijing during the Olympics and a big nuisance for DC right now. But each city will survive. PS for DC-ites: Why does the new farecard have the odd starting value of $5.45? Because I had an old card to trade in with 45 cents on it, and the only US bill I had handy at the trade-in machine was a $5. PPS for Beijing-ites: Draw no worrisome conclusion from the displacement of the pandas. Everyone still loves them.